I ate rice when I was a kid but it was boring—mushy and bland. Perhaps this is why Uncle Ben remains a characterless cipher to me while I harbor good associations to Betty Crocker and Aunt Jemima. Later, in the course of experimenting with more exotic cuisines in Berkeley, I discovered the aromatic joys of rice: the wonderful scent of the basmati and jasmine varieties. Fragrance is one of the most highly prized traits in cultivated rice and naturally it’s been the subject of scientific inquiry. More than one hundred volatile molecules have been identified in various cultivars—the one most responsible for the scent of perfumed rice is 2-acetyl-1-pyrroline or 2AP. This molecule is found in all parts of the plant but is obviously most desirable in the edible grains. How and why rice came to be fragrant is a tricky question and not just because of the intense issues of national and ethnic pride it raises. As a domesticated plant, rice has an extremely complex evolutionary history. Plant geneticists have identified two major varietal groups: Indica and Japonica. The two subpopulations of Indica include the jasmine scented cultivars, while the three subpopulations of Japonica include the Basmati types. Classical genetic studies back in the 1930s and 1940s established that the gene controlling fragrance is located on chromosome 8. Modern techniques in the 1990s pinned things down more precisely to a gene called BADH2 which makes an enzyme called betaine aldehyde dehydrogenase. This enzyme oxidizes (which in this context means destroys) the precursor molecule of 2AP, the chief perfume molecule in rice. It turns out that several minor mutations in the BADH2 gene render it nonfunctional. This leaves more 2AP precursor molecules hanging about, which means more 2AP is created, which means the rice is more fragrant. 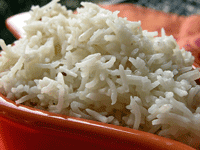 In other words, perfumed rice is the result of a genetic mutation. So how did the original mutation arise and spread? There are two possibilities. Early farmers could have discovered the mutated strain in the wild and then domesticated it, or the mutation could have occurred in a variety of rice already under domestic cultivation. In other words, people were already farming Japonica type rice (the forerunner of Basmati) when a random, fragrance-generating mutation popped up. Liking what they smelled, the planters selectively bred these plants for scent. The badh2.1 allele traveled along as people migrated, and was accidentally or deliberated interbred with other, previously unscented varieties. And so today we have the great range of aromatic types. Cool, eh? And now it’s time for a great big plate of biryani.